As cellist of the Aleron Trio, Anne has performed on critically acclaimed tours of France and recently completed a residency with the Southeast Iowa Symphony performing Beethoven’sTriple Concerto and giving school and community outreach presentations. Aleron Trio will again perform the Triple Concerto with the Venice Symphony in Florida. This season Aleron Trio performed in the Yehudi Menuhin Festival led by the Alexander String Quartet and performed in a master class with the Juilliard String Quartet. Anne has performed Schoenberg’s Pierrot lunaire throughout the country at venues including Kennedy Center with chamber group Nonsemble 6. Performed memorized, Anne interacts with other members of the ensemble to present a staged performance of this monumental 20th Century work. Anne performs the work again this spring at UC Santa Cruz, Stanford and Salle Pianos in San Francisco. Anne received her Bachelor of Music Degree from Vanderbilt University where she double majored in English Literature and her Master of Music Degree at the San Francisco Conservatory as a student of Jennifer Culp. 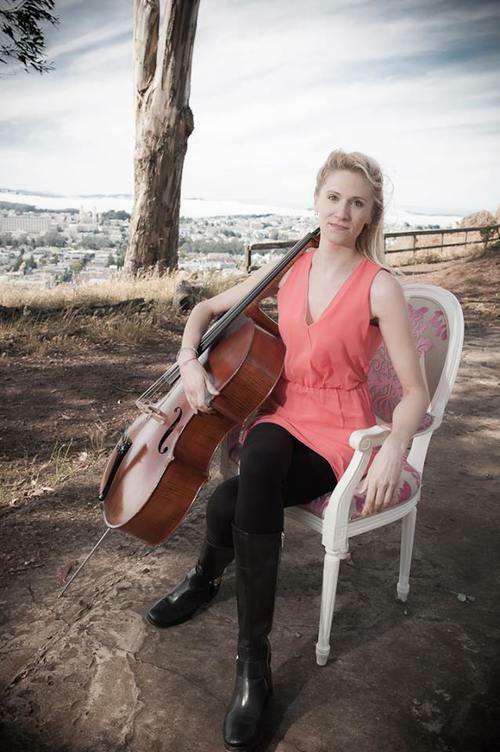 Anne also studied in Australia at the Sydney Conservatorium, where she served as principal cellist of the orchestra. Anne began her cello study with her mother Carolyn Suda at age four.